Good news, Cisco Application Visibility and Control – AVC NetFlow support will be in the next release of our NetFlow collector. We are one of the first vendors to announce support for these new NetFlow v9 exports that are configured using Flexible NetFlow. The Cisco Application Visibility and Control (AVC) solution is a suite of services in Cisco network devices that provide application-level classification, monitoring, and traffic control to improve business-critical application performance, facilitate capacity management and planning and reduce network operating costs. You can find Cisco AVC Q&A information on their web site. With so many applications using port 80 or 443, traditional identification of applications based on ports no longer works. This is especially true for those applications which are cloud based. Cisco Application Visibility and Control (Cisco AVC) restores the granularity required for today’s networking needs using a combination of tools that may already be present across your network. 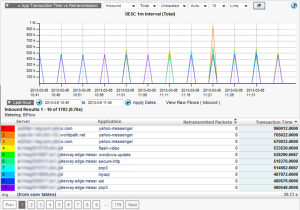 Delivers details on response time between the packets within the flow as well as retransmits and several other details. Identifies applications at layer 7 (E.g. Facebook, Youtube, BitTorrent, mysql, iTunes, etc.). URLs can also be exported but only with IOS version 15.2(4)M2 or more recent. The Cisco AVC solution is provided within the Cisco Integrated Services Routers Generation 2 (ISR G2), Cisco ASR 1000 Series Aggregation Service Routers (ASR 1000s), and Cisco Wireless LAN Controllers, which all support NetFlow. Our Cisco AVC Reporting solution provides all the reports including those with URL details. It’s another Plixer first. Jake Bergeron is currently one of Plixer's Sr. Solutions Engineers - He is currently responsible for providing customers with onsite training and configurations to make sure that Scrutinizer is setup to their need. Previously he was responsible for teaching Plixer's Advanced NetFlow Training / Malware Response Training. When he's not learning more about NetFlow and Malware detection he also enjoys Fishing and Hiking.